5 Reel, 30 Payline video slot with features such as Scatter and Wild symbols, Split symbols, and a Cats Free Spins Bonus Round. The minimum per payline starts from 0.1 up to 10.00. 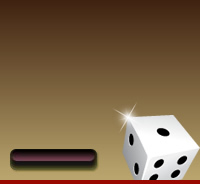 The maximum bet amount is 300.00 per spin. The top prize is 250 000. The Cats Logo Wild acts as a substitute for other symbols to complete a winning combination. The wild does not substitute for the Paw Print Scatter symbol. The Cats Logo Wild symbol can substitute for the Cat symbols, and will count as Double the image symbol. When substituting for a Cat symbol, the Wild symbols are always evaluated using the Split Symbols feature, making the Cats Logo Wild symbols very valuable. 5 or more Paw Print Scatters anywhere on reels 2, 3, 4 will activate the Free Spins Bonus Round. Each animal symbol has 2 parts: ‘Single’ and ‘Doubles’ symbols. The Single symbols show 1 Cat. The Doubles symbols show 2 of the same Cats which use the Split Symbols Feature. Winning combinations are based on the amount of matching Cats on a payline, not just the amount of matching symbols. Land from 3 up to 10 matching Cats for big wins. 5 or more Paw Print Scatters on reels 2, 3 and 4 will activate the Bonus Round. 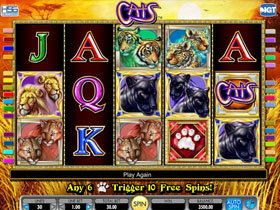 5-10 Free Spins will be released depending on the amount of paws in the scatter symbols. The game will re-trigger when the scatters re-appear on the 3 middle reels at the same time.